Will old film SLR lenses work on a new digital SLR? It depends on the camera brand. Many companies have recently changed the way their lenses and cameras fit together, so older lenses won’t fit or won’t do everything they should. The list below tells the story for each brand. Please be careful and check your camera and lens manual first, though - you can damage your camera or lens by fitting the wrong ones together. Old film SLR lenses change a little when you put them on most digital SLRs. They actually zoom in a bit further, as digital SLRs only see the centre half of the picture. This is rarely a problem for long zoom lenses, as they will zoom even further on a digital SLR. But it is a problem for landscape photographers and real-estate agents who need wide-angle lenses, as the lenses won't see as wide as they did before. Most companies now make a new series of lenses specifically for digital SLRs to fix this. If you have old lenses that you need to focus by hand and they fit on a new autofocus SLR, you'll still have to focus by hand. Are old manual-focus lenses any good on a modern digital SLR or mirrorless camera? It depends what you shoot. If you shoot things that don't move - landscapes or still-life scenes - they're very good, and an absolute bargain to boot. You can get excellent old $500 lenses for $20 at the local pawn shop. If you shoot moving things, like children playing, it's a different story. At first I took the macho approach, thinking that I'd been focusing by hand for years, so it won't be a problem to carry on. I was wrong. Most non-professional digital SLRs have small, dim viewfinders (to keep the cost of the camera down), making manual focusing much harder than it ever was with film cameras. Autofocus is more than just a convenience these days. There's another minor challenge to using old film lenses on a modern digital camera: the sensors in digital cameras have glass in front of them, but film didn't. The glass changes the path of the light just a tiny bit, and means that lenses designed for film can't give their best on digital cameras. It's a very small effect, and most people would never notice. It degrades the edges of the picture much more than the middle, and the size of the problem depends on two things: the thickness of the glass in front of the sensor of your camera (called the "sensor stack" - the thinner the better), and how parrallel the light rays are coming from the lens (measured by the lens' "exit pupil distance" the longer the better). Different camera brands have different thicknesses of sensor stack, so lenses for one brand may not give their best if used on another brand with an adaptor. If you want the geeky details, this page is the authority. Any Canon "EF" lens made after 1987 will fit any Canon digital SLR, but none of the old “FD” mount lenses made before 1987 will fit. The "EF" lenses have electrical contacts at the back where they join the camera. Take care to keep these contacts clean, or you can get odd behaviour from the camera. Canon make an even newer series of smaller "EF-S" lenses that are designed just for their digital SLRs, and they fit on the EOS models 100D, 200D, 300D, 350D, 400D, 450D, 500D, 550D, 600D, 650D, 700D, 750D, 760D, 1000D, 1100D, 1200D, 1300D, 20D, 30D, 40D, 50D, 60D, 70D, 77D, 7D and 7DMkII (but not on the older D30, D60 or 10D). Don't put these newer "EF-S" lenses on an old film camera or a 1D series, 5D series or 6D series - if it fits, it will break the camera's mirror. The new Canon mirrorless EOS-M camera introduces yet another new, smaller EF-M mount. You can fit any of the existing EF lenses for SLRs onto it using the "Mount adaptor EF-EOS M". But EF-M lenses only fit the EOS-M.
Nikon have kept the same coupling for nearly 60 years, so just about all lenses will fit (although they may not do everything). But Nikon will announce a new lens mount on 23rd August 2018, and we can only guess what's going to happen then. 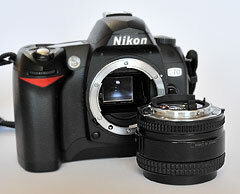 Today, I’m happily using a 40-year-old lens on my professional Nikon digital SLR... but I have to focus it myself. Except for the five new "AF-P" lenses, any Nikon autofocus lens will focus automatically on any Nikon digital SLR except on the Nikon D40, D40x, D60, D3000, D3100, D3200, D3300, D3400, D5000, D5100, D5200, D5300, D5500, D5600. These fourteen SLRs will only autofocus with newer lenses called "AF-S" lenses. The budget range of "AF-P" lenses have a new type of focus motor and they won't focus at all (even in manual focus) with pre-2013 Nikons. The AF-P lenses only work perfectly with D500, D3300, D3400, D5300, D5400, D5500, D5600, D7500 and newer cameras. The AF-P lenses work with "limited function" with the following cameras (and we're trying to find out from Nikon exactly what "limited function" means - so far it seems that autofocus is OK, but manual focus doesn't work): D5, D810, Df, D750, D5200, D7100, D7200. To confuse the issue further, not all lenses allow all functions on all cameras. This table gives the details. Nikon instruction manuals normally have huge tables explaining what will and won't work together. If you have older equipment, make sure you read them. Lenses from 1975 will fit. Autofocus lenses from 1987 will also focus automatically, lenses from 2004 will offer all features. This page gives all the gory detais. The Pentax K-01 is an oddity: a mirrorless camera that works well with all Pentax lenses. It's a bargain way to get great-quality landscapes at a tiny price with second-hand Pentax lenses, but older lenses won't autofocus, so I wouldn't recommend this approach for shooting fast moving things. Introduced in 2008 to finally shrink the SLR, Micro Four Thirds lenses are smaller than traditional SLR lenses because they don't have to leave room behind them for a mirror. Original "Four Thirds" lenses will fit (with an adaptor), but not all of them focus properly with micro-four-thirds cameras. Check the individual manuals to see. Panasonic and Olympus lenses are interchangeable between the two brands with only minor changes. Olympus lenses stabilise better on Olympus cameras, and Panasonic cameras focus and stabilise better with Panasonic lenses. Sony E mount, Fuji X mount, and Samsung NX mount (now discontinued) are new systems each with their own new lenses that are not compatible with anything else. Why have they done this? The cameras and lenses are small... very small. But there are plenty of adaptors that will let you use older lenses manually. Metabones adaptors are great; FotodioX are cheaper, and have a fun "tilt" adaptor, that lets you clumsily change the plane of focus for a different look. The Metabones "Speed Booster" adaptors are a novelty: they make the lenses give the same view that they did on film cameras, with an added bonues that they let more light in. Once there are cameras that can focus them quickly, they could give new life to good old lenses. Any autofocus Minolta lens made after 1985 will fit and should give full (or almost full) functionality on any Sony or Minolta SLR. Konica-Minolta’s camera business was bought by Sony in 2006. These full-frame mirrorless cameras get a special mention, as they are particularly compatible with other brands of lens - indeed Sony seems to be marketing them to tempt users of other lenses to defect to Sony (they're often sold with a free Metabones adaptor). The latest a7RIII promises good autofocus with Canon lenses, with adaptors for other brands on the way. We've tested it with Canon lenses and found it to be excellent for stationary subjects, but not quite good enough for moving subjects. It's only just behind focus on Canon cameras for Canon lenses. Hopefully, 1 more generation of camera and it will be 100% percent competitive. It's a big deal for us. Because we teach all camera brands on our photography courses, we have all brands of lens. The a7RIV might let all our photographers use their favourite brand lenses on one type of camera. Can't wait to see! This page is a good starting point to using other lenses on Sony cameras. These independent brands of lens are made to mount on cameras from just one manufacturer. In theory, they should be as compatible as the lenses of the camera manufacturer of the same vintage. But in practice, it’s not always true. I’ve seen several cases of old independent lenses not focusing accurately on new digital cameras, in ways that can’t be corrected easily in a service centre. Or just not working at all. New independent lenses won’t have any such problems... if they do, the manufacturer will fix them. This information is for guidance only, and applies to most consumer lenses. You can damage your camera by fitting the wrong type of lens to it. Some lenses will break the camera’s mirror; others may damage the electrical contacts. So please be careful and check your camera or lens manual first. Some advanced functions have only recently been invented (such as the lens telling the camera where it is focused), so older lenses seem to work perfectly, but might not be making full use of the latest features on an SLR. Links to other sites are provided in good faith, but we can't take responsibility for their accuracy.